Satkirti Filters has carved a niche in the market for Manufacturing and Supplying Filtration Equipment like Sintered Bronze Products, Compressed Air Filters, Process Filtration System and Pressure Vessels. Our superior quality Compressed Air Filters are widely used in filtration activities. Our Compressed Air Filters are used to remove dust particles and oil from the air after it is finally compressed. These Compressed Air Filters are manufactured by the compression of atmospheric ambient air containing all the usual pollutants. Use of advanced technology in their production ensures high performance. These Compressed Air Filters are in demand for the filtration of compressed air, as the air leaving the piston compressor or a standard screw have high water, oil and other contaminants content. 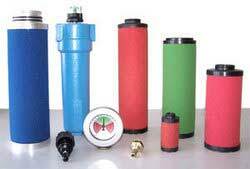 Our Compressed Air Filters are also used in different pneumatic applications. Why Our Compressed Air Filters?